Most observers consider E. Y. Mullins, president of Southern Baptist Theological Seminary from 1899 to 1928, to be the most influential Southern Baptist theologian and denominational leader of the twentieth century. 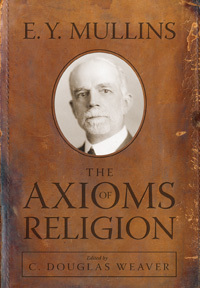 His book, The Axioms of Religion (1908) is considered his most-creative and most-enduring work. The book was received as virtual orthodoxy by Baptists around the world. Contemporary scholars continue to refer to the Mullins legacy. Some have severely criticized Mullins for excessive individualism. While some of his ideas are time-conditioned—for example, the Baptist tendency toward triumphalism—several of his axioms still capture the essence of Baptist DNA. Mullins is thus required reading for the ongoing dialogue about the relationship between individual faith and the community of faith. Until now no adequate edition of Mullins’s “Baptist classic” was available to evaluate his legacy and/or his continued relevance. This critical edition is unlike any other version of the Axioms of Religions. The text has been reproduced from the original 1908 volume. Annotations and explanatory notes that provide context are included when extra information benefits the reading of a 100-year-old text. Footnotes that identify the scholars Mullins cites (Mullins often did not footnote citations and when he did, he chose not to include full bibliographical data) are included to the extent possible. Complete with a critical introduction, this volume sets a new standard in Mullins study and in the study of Baptist history by restoring Mullins to his rightful place.